Having problems with your ReBuilder? Take a few minutes to perform these basic checks. Most problems can be solved at home. If you are still having issues, call customer service during normal business hours at (877) 717-5487 and we will be happy to help you, or facilitate your repair. 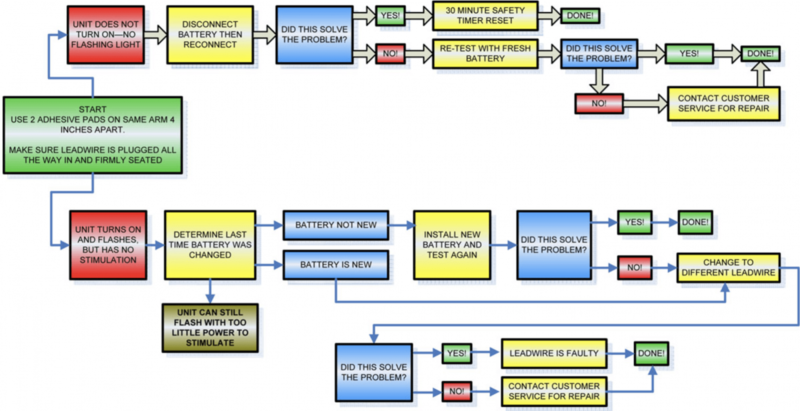 The flowchart above can be used to diagnose most simple problems for the model 300 ReBuilder and each output of the model 2407 individually. Always begin your test with a good 9V battery, of 8.5 V or higher. For the 2407 begin your testing using the battery and on the 7.83Hz setting. Once you have verified the ReBuilder is sending a signal using the flow chart above, you can easily pinpoint an application issue. Look for signs of damage to the leadwire. Look for signs of damage on the adhesive pads. Do they stick well? Be sure you are using both pads connected to a single leadwire, with 1 pad on each foot. On average for the adhesive pads, we recommend replacement once the pads no longer adhere to your skin. For the leadwires we recommend annual replacement for the average patient. If they are used in a high traffic environment such as clinical use we recommend more frequent replacement than once a year. Check for signs of corrosion at the snap connector. Clean or replace as necessary. Be sure to use the garments damp with the electrolyte solution as instructed. Be sure both garments are applied at the same time, and not touching each other. Keep your garments clean. We recommend hand washing in a mild detergent once per week. DO NOT MACHINE WASH OR DRY. DO NOT USE WOOLITE. If you have met the conditions above, and verified the ReBuilder output using the flowchart, it may be time to replace your garments. Their conductivity and effectiveness will break down gradually over time with usage and wear. If one machine output works and the other does not, switch the leads from output 1 to output 2 (and vice versa). If the non-working area stays the same, check the application method as indicated above for the area in question. If the non-working area has now moved when you switched leads, contact customer service for further instruction to facilitate your repair. As simple as it seems, remember: Output 1 is controlled by the Left knob and Output 2 is controlled by the Right knob. The 2407 will function on AC power without the battery installed, just as it will work on the battery without AC power. The two systems are independent. You can (and should) verify each separately. The most common problem is people who use it plugged in to a non-functioning plug or with a failed AC adapter, with the battery still installed. As there is no AC power, the unit works on the battery, which will then become depleted over time. If the device works with the battery, but not on the AC adapter, try another plug in a different part of the house, or verify the plug is working by using a lamp. You may have a blown fuse. If this does not solve the problem, replace the AC adapter. NOTE: This unit uses a voltage and polarity specific adapter, the wrong one may cause damage not covered under warranty.